The mobile concrete mixer comes in three basic styles: portable, trailed-mounted and on-site mobile mixers. If you need to move the mobile concrete mixer on the job site on a daily basis, it is suggested to get a lightweight mobile mixer. You can identify a lightweight mixer by its wheelbarrow design and its folding wheels. The large concrete mixer trucks, on the other hand, are capable of traveling across the town, from one job site to another. A typical mobile concrete mixer contains a rotating drum with a set of blades that mix concrete ingredients. 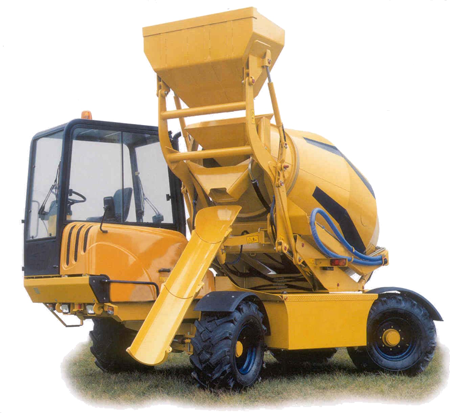 This type of concrete mixer is recommended for smaller jobs. In fact, the concrete mixing plants are the best choice when large amounts of concrete is needed, but trucks are needed to transport the concrete to the construction site. The typical mobile concrete mixer is ideal for projects where concrete is needed in more than one place, but in the same area. The mobile concrete mixer can be moved around the job-site without any difficulties. The mobile concrete mixer is usually used for making sidewalks and other smaller projects where concrete is needed on multiple locations. The working principle of the mobile concrete mixer is quite simple. Place the mobile concrete mixer on level ground and ensure that you have all necessary concrete ingredients right next to you. Start pouring the cement and simultaneously add water. Once all ingredients are inside the drum, start the mixing process by turning the mixer on. Once the concrete is ready, pour the concrete in the places where needed. However, pay attention how the mixer works. If the temperature is too high during the mixing process, it is recommended to stop the machine for a while and wait for it to cool down. The body of the mobile concrete mixer should be cleaned of materials which can easily stick to the body. Also, check the oil at all lubricating points. The main advantages of a mobile concrete mixer are the smooth working process, quality mixing provided, convenient operation and higher productivity. When combined with scale batching plant with a feeding device, it can be used at common construction sites, road, hydro-power and bridge sites. Another advantage of the mobile concrete mixer is the cost-effectiveness. It has no expensive and time-consuming set-ups, and still can do the same work as batch plants or truck mixers.